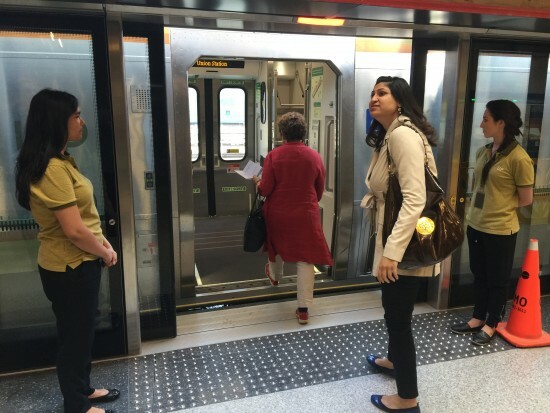 What’s it like to ride Toronto’s new UP Express? 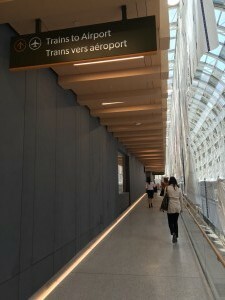 I had a chance to ride Toronto’s new Union Pearson Express (UP Express) train linking the city’s major Pearson International Airport with the central downtown hub, Union Station, linking to subways and an underground walkway through the downtown core. Yes, it has free WiFi. 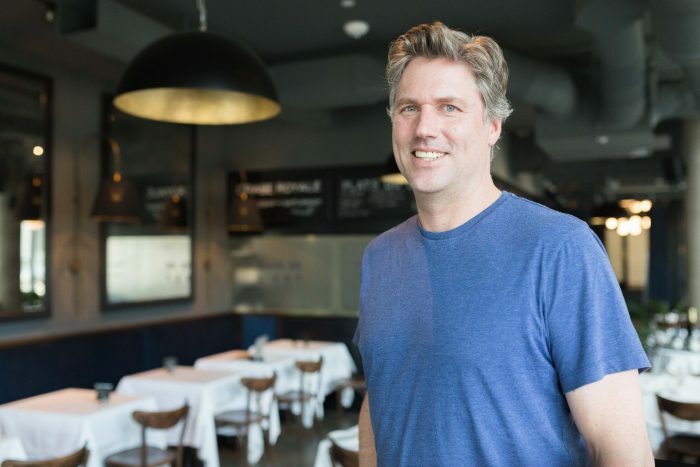 For those outside Toronto, the absence of a good link between the downtown core and the airport, which actually resides in neighbouring city Mississauga, has long been one of the many complaints Torontonians enjoy harping on. It is possible to ride the subway to a bus link that goes directly to the airport for a $3 fare, sure, but it would take you about half the day and the bus would probably smell funny so that’s no good. Instead what the regional transportation authority, Metrolinx, determined would be preferable is to pay $27.50 one-way or $53 return for a pleasant and quick train ride instead. The UP Express platform is accessed from the Sky Walk. There are a range of discount options for the fare if you’re a senior, student, or child (and if you’re under six it’s free). If you pay with a Presto card, which I hear some people actually have in their wallets, you get a discount. 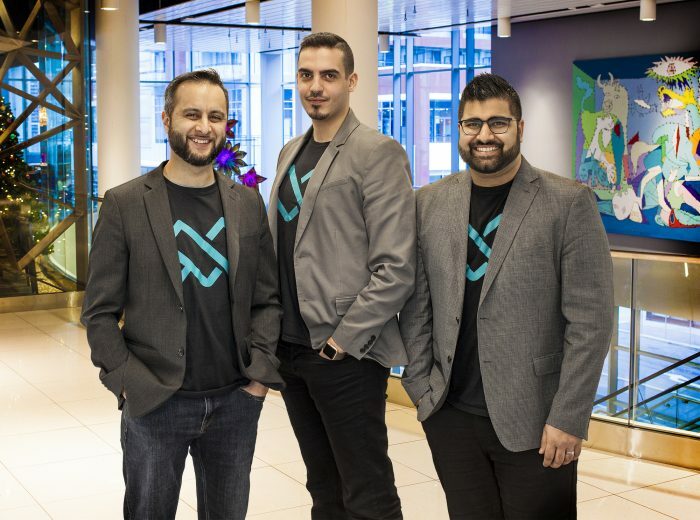 There’s two other stops along the line – one at Bloor Street (a short block away from Dundas West station) and one at Weston, just east of the Humber river – and riding from those stops to Union will cost you less for the shorter trip. My preview ride started at Union Station. Coming off of the Sky Walk, you enter the platform for the UP express. The first thing I noticed was all the light streaming in through the glass wall separating the platform from the track. There was a retail area where you can buy coffee and pastries (and on this occasion had complimentary cupcakes, which I’m assuming will not be available during normal operation) and a service desk. 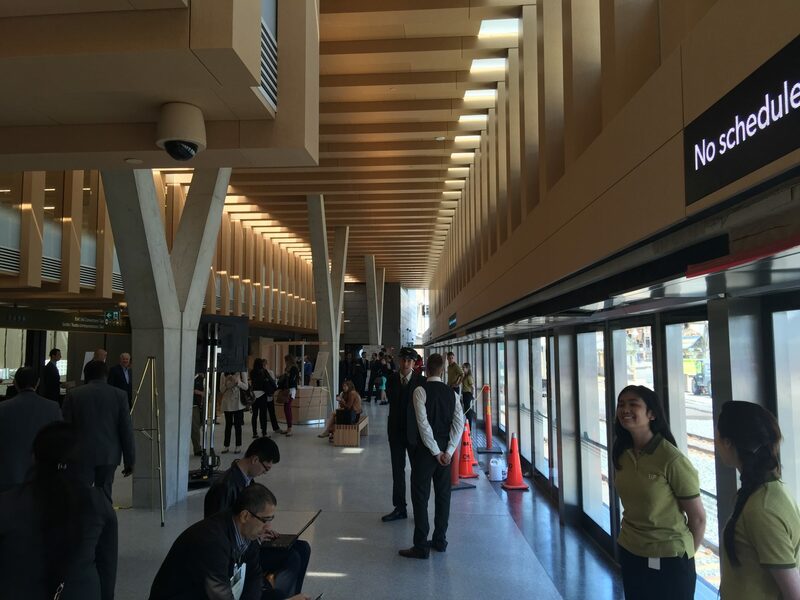 Staff from the UP express sit at the desk and mill around the platform, standing near the glass doors. 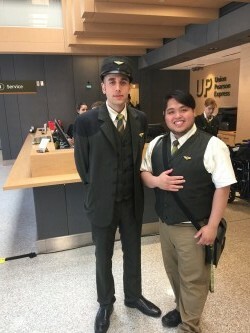 The UP Express staff wear retro uniforms that seem appropriate for train travel. uniforms resemble what I imagine the train staff of yesteryear wore as they hollered “all aboard” and then blew on a shrill whistle. Chatting with a couple of the staff, they tell me they will be working at the station during operating hours to receive guests from the train and answer their questions about navigating Union station and the PATH system. There are Y-shaped columns in waiting area, which I barely noticed, but I have to tell you how the brochure describes them. Somehow these columns both evoke the canopies of Union Station circa 1900 combining design, architecture, and history, and – I kid you not – are “based on the image of a person in a convertible with their arms in the air.” Which is exactly what I always think about when I think about early 20th century Toronto. Soon to open in the station is a second floor, a lounge sponsored by CIBC where you can enjoy beer from local Mill Street brewery. There’s an in-floor heating system, acoustic panels to reduce noise, and LED lighting. Since the train arrives every 15 minutes, you probably won’t spend that long here anyway. The UP Express seats are comfortably spaced and cushioned. The train pulls up and the glass doors slide open to allow the exchange of passengers. Immediately upon entering, I notice how clean the train is. Hopefully that will hold up after a few thousand passengers take a ride. The seats are padded and comfortably spaced apart, with proper accessibility seating available too. There’s an area near the door to stow your luggage, but it’s not a huge area as the assumption is that you’re wheeling along a carry-on sized suitcase. You can bet that there will be luggage in the aisles when you ride this train normally. There’s also a closed stowage space above the seats, similar to on an airplane. Probably the best part of the train and the platform area is that it provides complimentary WiFi. I connected with my smartphone and my laptop and after a welcome message from sponsor CIBC, I was connected to the Internet. There was also an outlet at my seat so I could charge my devices, and a seat tray attached to the seat in front of me folded down to provide a convenient space to set my laptop. The ride is smooth and quiet. You get some nice views of the city, especially as you zoom over the Humber River and the new elevated portion of track built to connect a rail line to the airport (at one point putting you 28 meters above ground level). It takes just 25 minutes to make the trip, according to the brochure, and it felt like less to me. The washrooms are larger than you’d expect for a train, and there’s HD digital signage with all sorts of relevant information to your trip and Toronto’s weather and tourism options. At Union station, you can buy tickets from a vending machine for the trip back. If you’re flying out, there’s four large screens with real-time flight information. There are also kiosks to check-in for your flight and pick up baggage tags. The train pulls in near terminal one, so you’ll need to hop on the shuttle to travel to terminal three if that’s what you need. Glass doors slide open to exchange passengers on the UP Express. 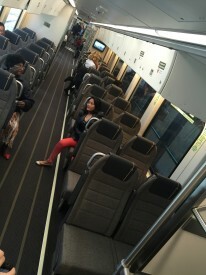 Overall the UP Express feels like a premium experience. I’d be interested to ride it after it opens to the public June 6 to see how crowded it gets and if the schedule remains reliable. But with trains coming every 15 minutes for 19.5 hours per day, it sounds like it will keep the flow of travellers moving well. I can’t help but look at the price per ticket and wonder if maybe the experience isn’t a bit too premium. If perhaps the platforms were built without Y-shaped columns, or if we could just do without smiling and well-dressed staff assisting us, or the train wasn’t a brand new one but just another subway car – maybe the cost could be closer to the $5 charged for Vancouver’s SkyTrain link to its airport. For that little, I might even live without WiFi for the 25 minute ride.